With Dubai gearing up for the 21st edition of Summer Surprises (DSS), Dubai Shopping Malls Group (DSMG) is offering shoppers a chance to win a luxury car during the six-week long sale. 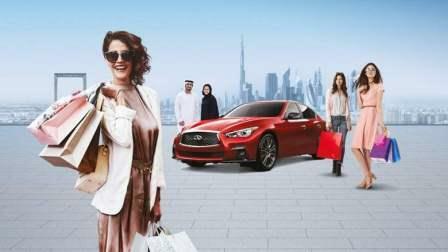 nder the patronage of Dubai Festivals and Retail Establishment (DFRE), 17 Malls across Dubai will host the 'Shop and Win Dream Drive' campaign that offers six sleek Infiniti Q50 cars to be won. Commencing on June 22, shoppers can participate with a minimum purchase of Dh200 at any of the participating malls. Upon the purchase, every shopper can enter the raffle draw which will take place every Saturday during the six weeks of DSS. The first draw will take place on Saturday, June 30 at the City Centre Meaisem, followed by raffle draws that will be held every Saturday at other participating malls including Dubai Outlet Mall, Oasis Mall, Reef Mall, Burjuman Centre and The Mall. Speaking on the 'Shop and Win Dream Drive' campaign, Majid Al Ghurair - Chairman, Dubai Shopping Malls Group, said: "Dubai has emerged as a favourite destination for millions of visitors seeking a safe environment for leisure and entertainment. With six cars to be won with this campaign, we expect added increase in the sale during this DSS." To be a part of the raffle draw, visitors can shop from any of the participating malls which Al Bustan Centre, Al Ghurair, Al Mulla Plaza, Al-Madina Mall, Burjuman Centre, City Centre Al Barsha, City Centre Meaisem, City Centre Shindagha, Dubai Outlet Mall, Karama Centre, Oasis Mall, Reef Mall, The Mall, Times Square Centre, Mizhar Mall, Al Khail Gate and Mizhar II Mall.